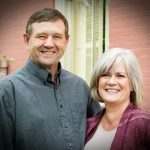 Billy & Debbie Franklin have been married for over 25 years! We are city girl meets country boy and living happily ever after! We live in the “boonies” in Arkansas, with our numerous English Golden Retrievers, Gabby, cattle, and horses. We have filled our home with “furry” children, since our human ones had the audacity to grow up into amazing young adults, move out, and begin taking responsibility for their own lives! Debbie was born and raised a California girl and my friends that are there, still can’t believe I live in Arkansas – honestly, I still can’t believe I live here either! I miss the beach, I miss the weather, but I love to travel and make those items a priority when I vacation! I hate the humidity in Arkansas, but love that I have very few wrinkles, due to the humidity in Arkansas. We have started horseback riding again after being without horses for several years. While Billy is a very skilled rider, Debbie is slowly gaining her confidence and ability to climb back on again, after a nasty fall several years ago. While the dogs and puppies keep Billy very busy, he also has cattle that he enjoys raising, along with the summer chores of cutting and baling hay. He has feeding and playing with the dogs and puppies, checking the cows, riding horses, and fixing fence. Being outdoors – that is where you will find Billy! Billy & Debbie love to laugh, work, and play. We believe all things happen for the right reasons. Our favorite moments are spent with family and friends and playing with all the adorable, teddy bear English Golden Retriever Puppies! We consider it an honor and privilege that families choose Wisteria Goldens for their “furry” family members.